I have a confession to make – I am a terrible solo traveler, and an even worse solo hiker. I just love to share travel experiences, like that ‘WOW’ moment when I saw the Iguazu Falls for the first time, or when I walked over the Golden Gate Bridge, saw my first Buddhist temple in Asia or the sunrise at Angkor Wat. 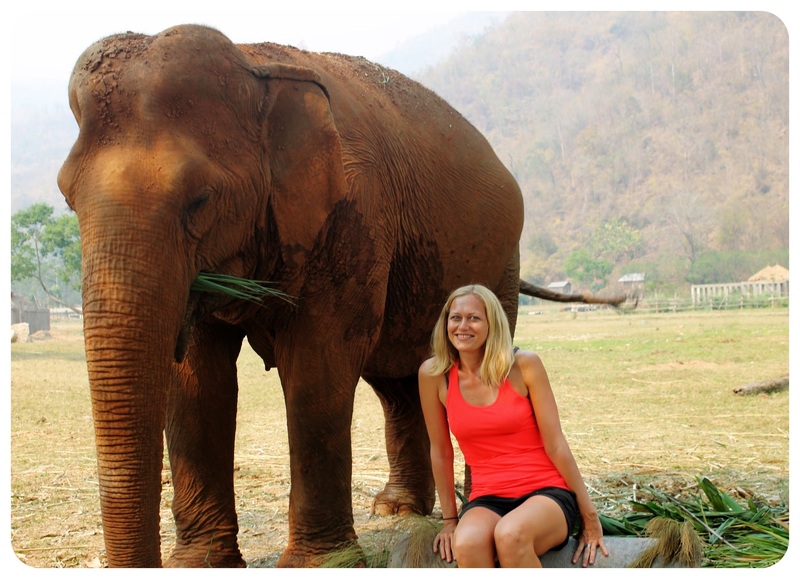 Of course these would have all been amazing experiences as a solo traveler, but it has always felt more fulfilling to share these with Jess as we travel the world. Hiking is even more of a partner activity for me, as when Jess and I set off on a hike together, somehow we always end up having the deepest conversations and discussions – like the day we became mountaineers (well, kind of) or cave explorers together. Jess had left me on my own on a hike once before, which was the day I became a volcano climber, but this time it was due to an ankle strain, not a disinterest in hiking an active volcano in Guatemala. 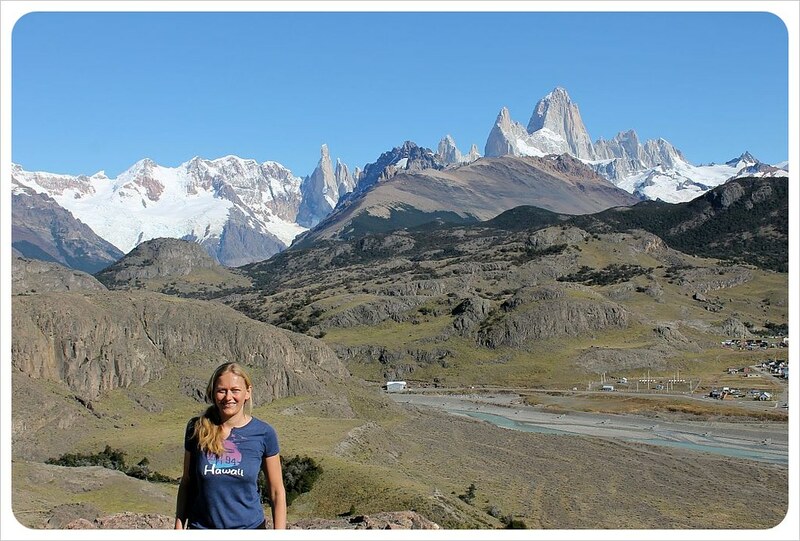 She was disappointed not to be able to hike in Patagonia, and I just wasn’t sure if we should visit El Chalten at all – the self-proclaimed trekking capital of Argentina and a 27 hour bus ride down from the city of Bariloche. In the end, my curiosity won and we still went ahead with our plans, but decided not to stay as many days as we would have had we both been in top shape. After all, I hadn’t hiked in who knew how long, and instead sampled my way through Chile’s finest cakes – what kind of hiker would I even be? 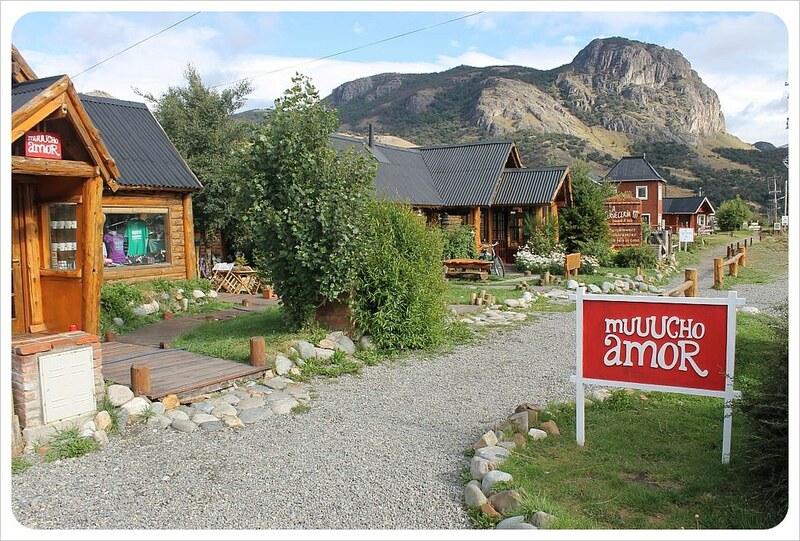 From the minute we arrived and drove through El Chalten to our hostel, I knew we had made the right decision. 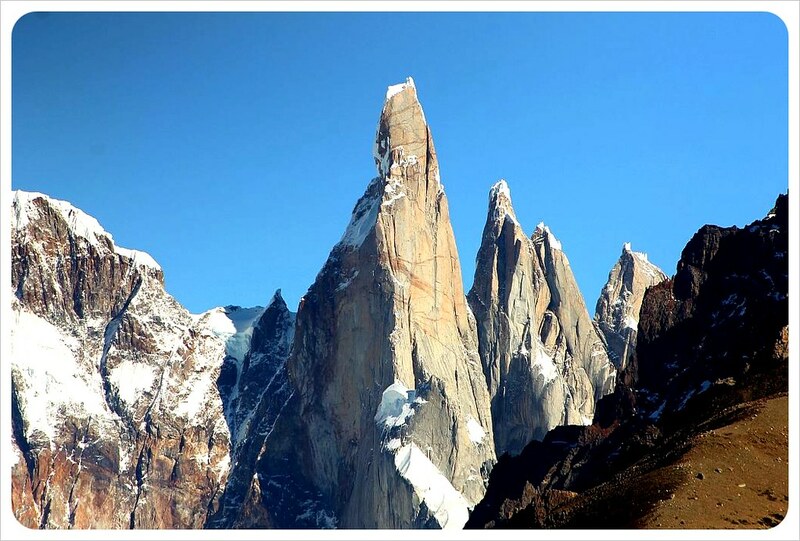 Founded in 1985, the tiny village serves exclusively as a base for hikers to climb the famous Fitz Roy mountain range. There is something magical about this little town, which is surrounded by mountains and hiking trails, some starting just 50 meters from the main road. Despite being very remote, the infrastructure is excellent (except for the Wi-Fi) with adorable restaurants, cafes and a wide range of hotels to choose from. Because we booked late out of hesitation you won’t see a Hotel Tip of the Week of ours, an overpriced collection of shipping containers converted into rooms. After reading up on the several hikes, I was torn between the hike to Laguna De Los Tres, which is supposed to be the most spectacular hike and Laguna Torre, which seems to be the most popular one. In the end I opted for the latter – after not having done any hikes in months (and going entirely by myself) eight hours seemed more achievable than ten hours. 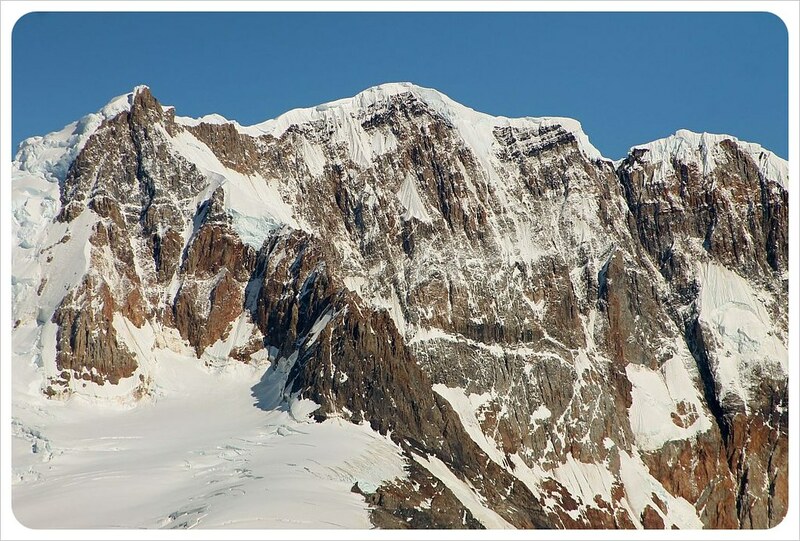 Plus, the hike to the actual Laguna is only three hours, with the option of another hour to a viewpoint for close-up vistas of Glaciar Grande and Cerro Torre. If I couldn’t go any further, I would make it to the Laguna at least. I was excited for my adventure. The next morning, my cloud of excitement had lifted a little – was I really able to do this? Walking through town to pick up some snacks for the hike, I felt slightly out of place. I was the only person not fully kitted out in North Face hiking gear. Swarms of hikers had already set off on their hikes, equipped with walking sticks, fancy hiking pants and camel paks for optimal re-hydration, and there I was in jeans and sneakers, not having walked anywhere for more than a few hours since… I couldn’t even remember our last hike. The trail head to Laguna Torre was up on top of a steep hill west of the village and I started climbing up with quick steps, passing other hikers and feeling confident with my hiking skills. Five minutes in, however, I started struggling, completely out of breath and a sharp pain in my lungs. This wasn’t looking too good. I kept pushing through – there was no slowing down after having just blown past my fellow (and possibly semi-professional) hikers. I had let them hear me huffing and puffing up past them, completely soaked in sweat and there was no admitting defeat. Once I made it to the top of that hill, however, and continued on a level path, my body started to adjust and I was able to catch my breath – but I wondered what I had gotten myself into. Before I started doubting myself too much, an Argentine backpacker passed me with a 70 liter backpack, plus a sleeping mat and cooking gear dangling from his pack and I knew it was time to pull myself together and keep going. And I am glad I did. With every turn, a new gorgeous view revealed itself, and the changing scenery kept the hike interesting: first the path followed the course of a river at the bottom of the cliffs next to me, and then the trail went through a forest until the trees disappeared and gave way for the first glimpse of Glacier Largo in the far distance (Cerro Torre was still hidden by clouds). The trail descended and wound through a dead forest until it met the river, followed by a rocky mountain path. 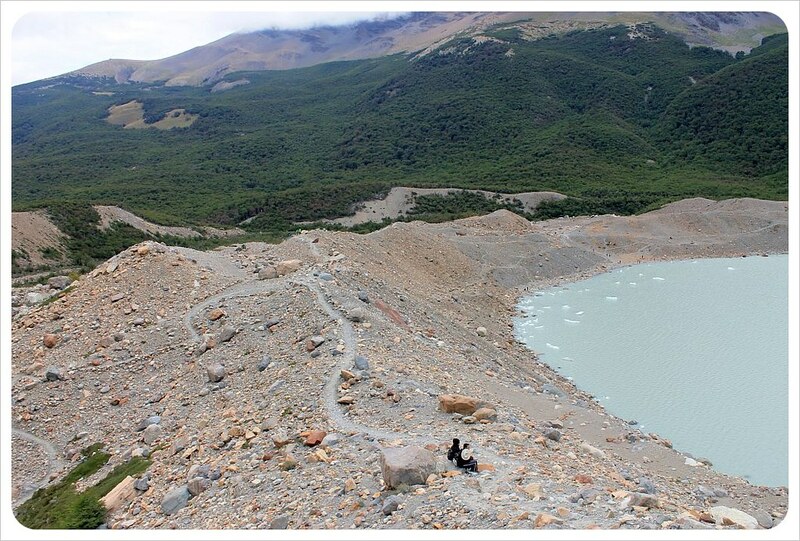 And all of a sudden, a mountain lake emerged in front of me – could this be already Laguna Torre? I checked my watch and saw that I had only been walking for two hours. As I turned around the corner, I saw big groups of hikers gathered, taking pictures of themselves, enjoying their lunch packages and others who made their way back already. Not only had I made it, I had also gotten here an hour faster than expected. I decided that I was definitely able to make it through the last part up to the viewpoint. 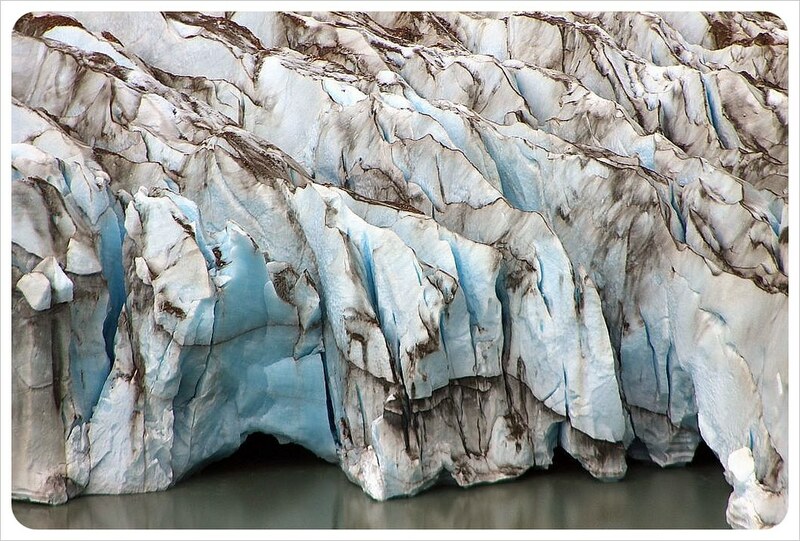 The blue ice of the glacier looked beautiful and I wanted to see it up close, but after the success of the hike so far, I hadn’t expected such a tough path for the last bit – I was basically walking on a narrow edge of the crater around the lake on rocks and pebbles. The views made up for it in the end, and the glacier actually reminded me of the Black Glacier we had visited in Bariloche, with the right side of it completely covered in debris and brown dust. 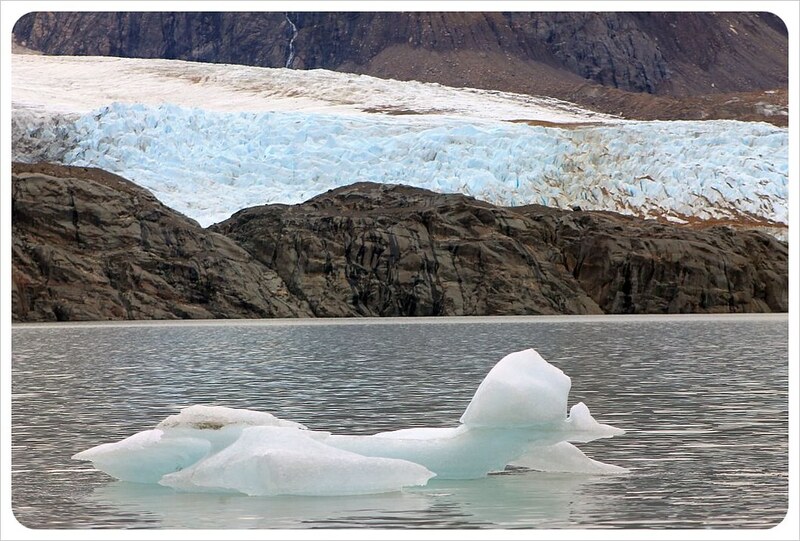 Like at the Black Glacier, the lake was filled with floating icebergs that had carved off the glacier, but compared to Perito Moreno this Glaciar Grande – despite its name – was tiny. Even though I was proud of myself for making it here and was in awe of the breathtaking views, there was something missing: my hiking buddy. Without Jess, I just couldn’t enjoy this hike to the fullest. 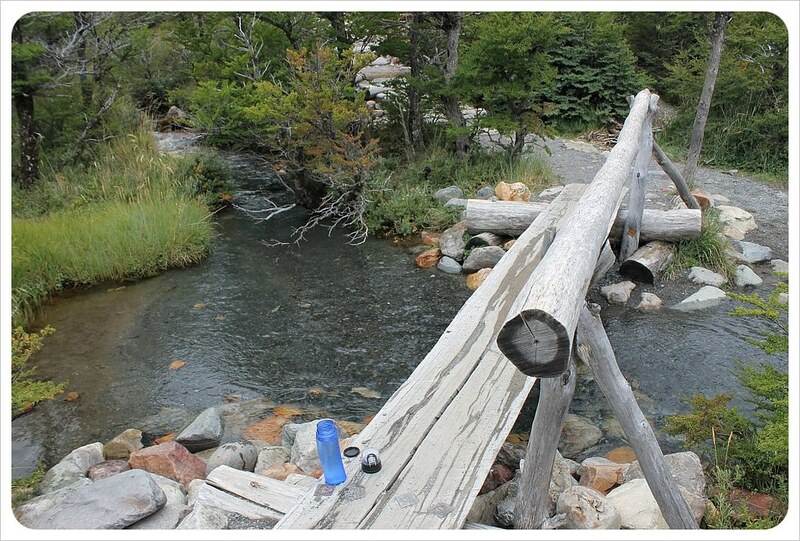 After breathing in the crisp mountain air and eating my picnic lunch, I turned to head back, and when I bent down at a stream to fill up my water bottle with fresh glacier water I felt like a true hiker! I returned beaming, bragged about my hiking skills to Jess and started making plans for the next day. 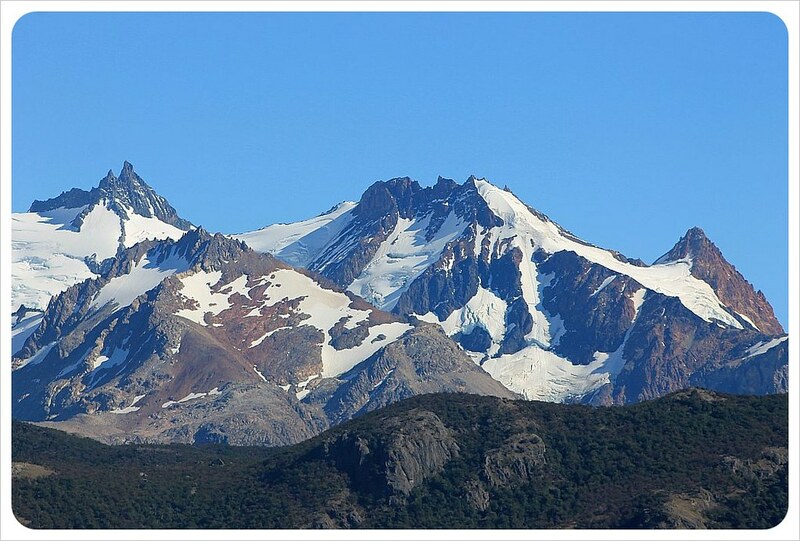 I would head south and check out a couple of the shorter hikes for good views over the Fitzroy mountain range and the town of El Chalten. The hikes to Mirador De Los Condores and Mirador de las Aguilas are perfect for that and the weather forecast was for perfectly sunny weather. I woke up the next morning pumped to get hiking, and both trails were easy and refreshing. 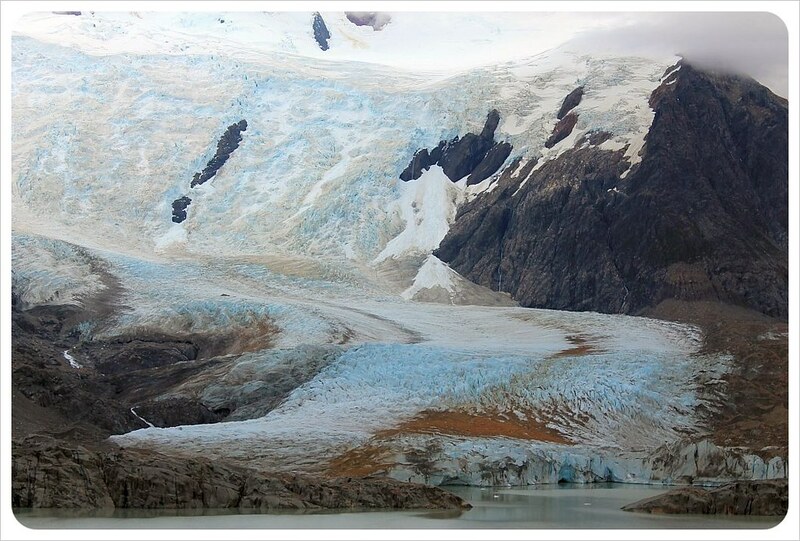 I felt like a pro and wanted to stay in town and hike every trail possible – but traveling through Patagonia in high season means booking hotels days or weeks in advance, so we already had our place in El Calafate reserved and were pressed for time. The trip to El Chalten was surprisingly positive despite our short time there, and when compared to Torres del Paine in Chile, this hikers haven was much better for independent day treks. All the hiking trails can be reached within minutes from anywhere in town and can be hiked entirely for free! 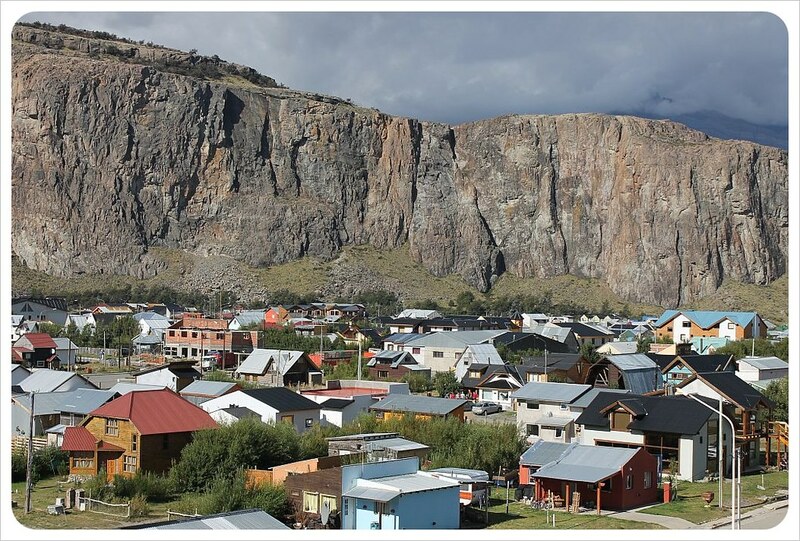 In Torres del Paine, on the other hand, hikers must base themselves in Puerto Natales (two hours away) and bus it in to the National Park, unless you do one of the multi-day treks which are much more intense. El Chalten has overnight hikes, too, and the camping is free, unlike Torres del Paine where staying in refugios can be very costly. 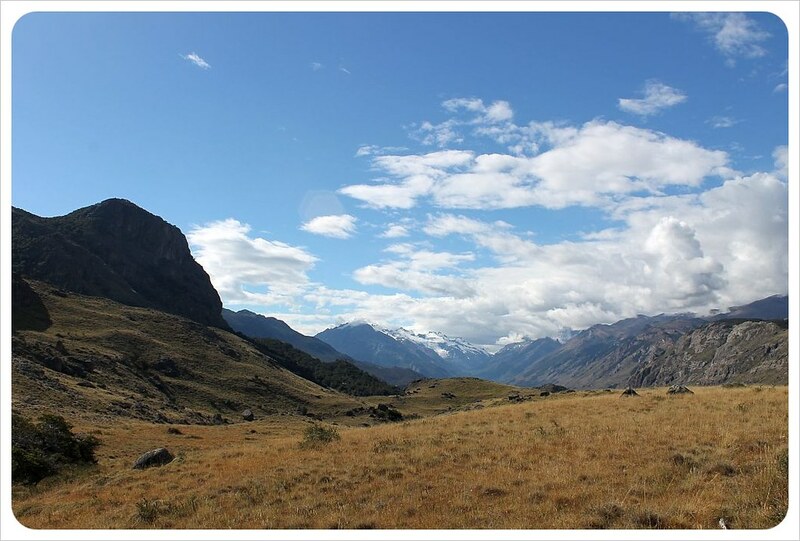 If you, like us, prefer to sleep in a comfortable bed rather than in a tent (especially in this part of Patagonia, where the weather can change within minutes), El Chalten is the perfect base for a trekking trip. In my opinion, El Chalten is definitely the best place for hiking in Patagonia and should not be skipped. Fly in – We wouldn’t necessarily recommend the 27-hour bus ride we took from Bariloche to El Chalten on a mainly unpaved road. Flying into El Calafate and taking a bus from there (appr. 2.5 hours on newly paved roads) is a much more comfortable option. 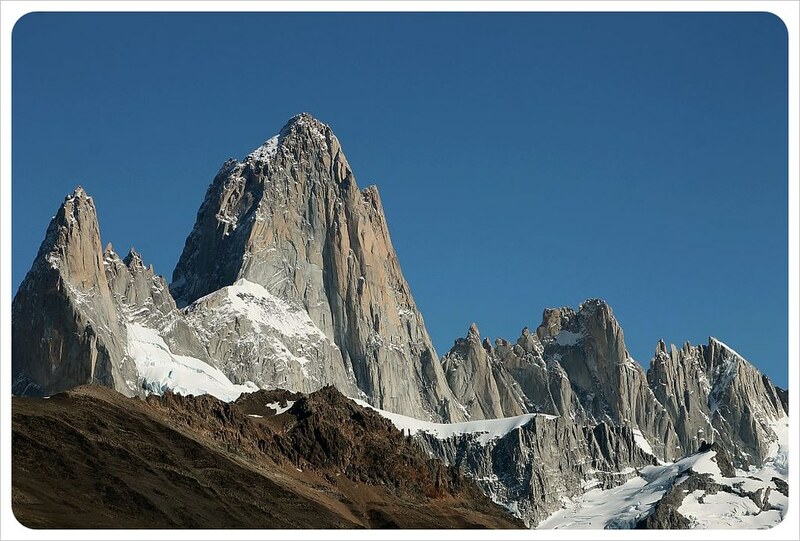 Book in advance – We traveled in the Argentine summer, and if you plan to visit El Chalten in high season (Dec – Feb), make sure to reserve a hostel/hotel in advance. We learned it the hard way and ended up having to stay in an overpriced, mediocre hostel. 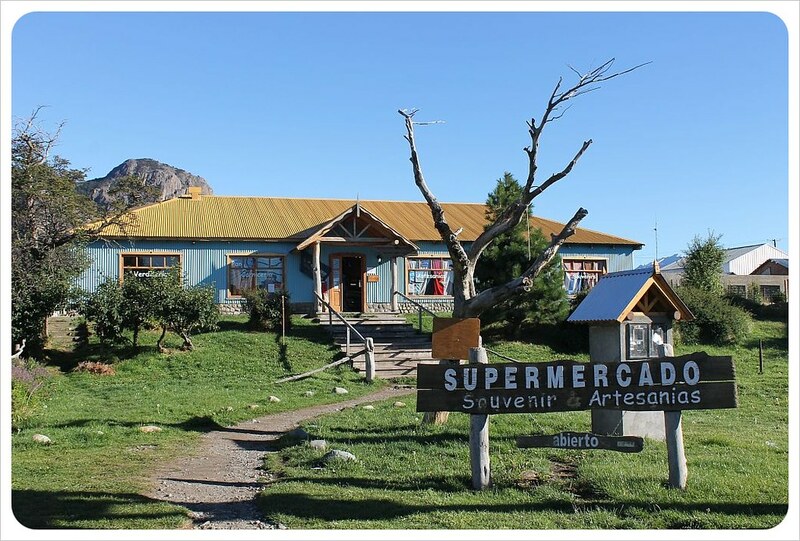 ATMs – Contrary to our outdated Lonely Planet, there are now two ATMs in El Chalten and you don’t need to arrive with stashes of cash. Internet – Even though most hostels and hotels advertise free wifi, the connection was so bad that most websites wouldn’t even load. The best wifi connection we found was at the café in the lobby of the La Aldea hotel (Av. Güemes 95). 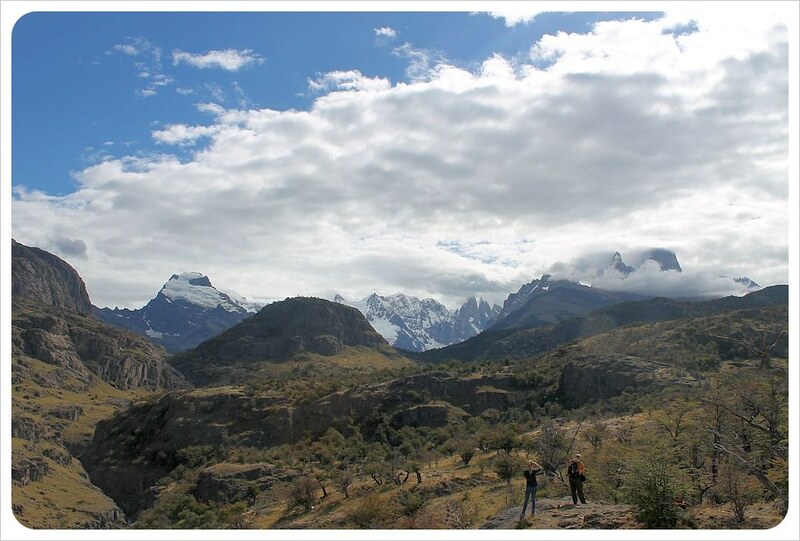 Hiking – The El Chalten website has a good overview of all self-guided hikes in the area, plus details on the trails, ascents, difficulties and hiking times. The tourist office on the south side of the village has maps of the area, but all trails are signposted well. 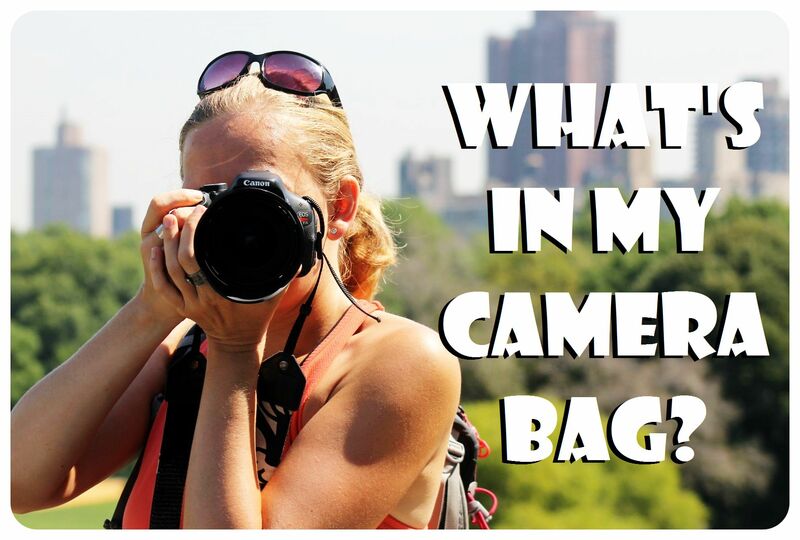 Gear and food – I didn’t have any special hiking gear and didn’t need any for the trails I hiked. Wear layers as the weather changes dramatically throughout the day and also with altitude. There is no food available outside of the village, so make sure to pack a picnic lunch and snacks before you set off, but water can be refilled in the glacial water of any of the streams along the way! 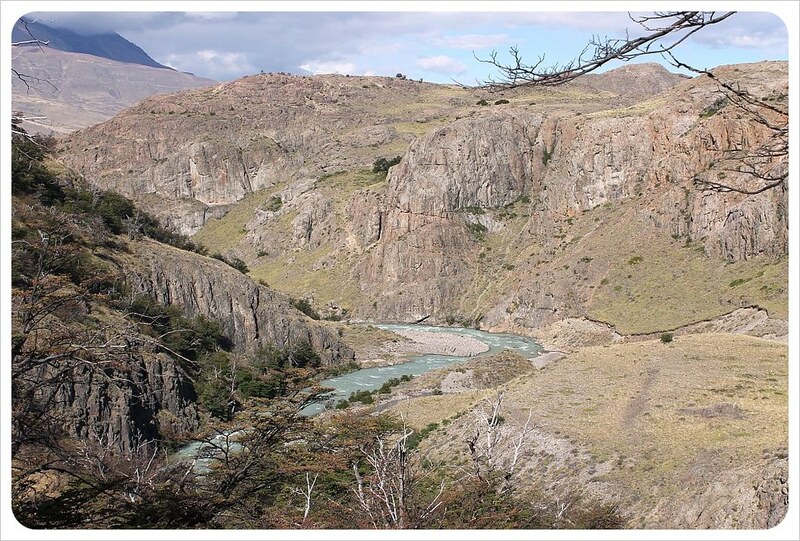 You can find our complete route through Patagonia here! Including detailed information on transportation, costs and how many days we’d recommend for each place. One of my favorite places!!! 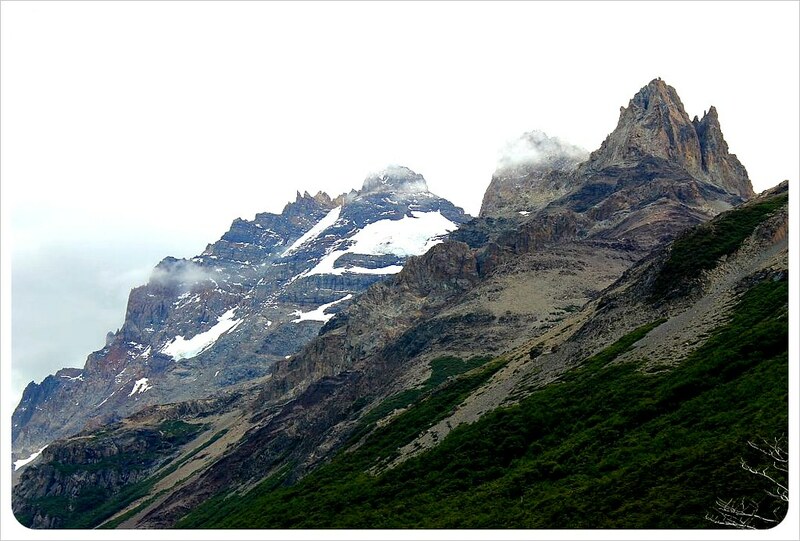 And I agree, I think Argentinian Patagonia is much better than Chilean Patagonia. I’m so glad you enjoyed it. The photos are beautiful. Dany, Thanks for your personal take on doing things alone. I’ve done both in my time but mostly with another in recent years. Although traveling alone can be the ultimate in freedom, it can be lonely. It’s always nice to be able to share experiences with a significant other. Even when traveling alone, I’ve always been able to find someone to share in the moment. There are pros and cons of both and I think a mix of both will be my plan for future tripping. Ah Ha, The rest of the story! I was thinking a couple three days to recover, not a couple three weeks! Also, I wasn’t aware of such high prices for everything. High season is a drag, especially in already high cost areas. I should know better than to second guess you guys. If you don’t know how to travel, nobody does. Talk about burning through money, how’s New York treating you? Out of the frying pan and into the fire? It’s a good thing you are house sitting! It is actually a relief for our wallet to be here, Steve 🙂 I think rent is by far the highest expense in NYC, but everything else is pretty cheap, compared to Chile and Argentina! Oh, Chalten. I think I left a piece of my heart there. It is such a fantastic place – and with a brewery to boot! 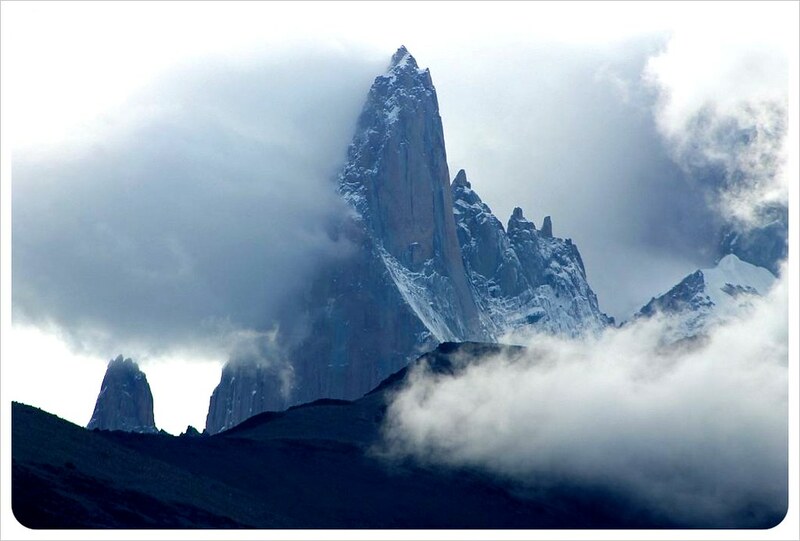 Thanks for the post and letting me relive Chalten for a few minutes. Brian, I can totally understand that! It is an amazing place and I hope I’ll get to return one day (and that the village won’t change all that much!) The micro-brewery was certainly a nice surprise when we got there, and so were the many vegetarian options!! Great write up! I’m an avid hiker, but also prefer to do it with someone else (or at least my dog). Hiking and climbing in Patagonia is a complete dream of mine- mad props for rocking it!! Thanks so much, Megan – yes, hiking with a dog is something I love, too. We’ll actually be able to do that in Arizona later this summer and I am already looking forward to it! 🙂 I hope you’ll make it to Patagonia one day, it is soooo beautiful! Oh wow, the scenery looks spectacular! I had no idea that there were so many hiking routes in El Chalten. Looks like a great place to hang around for a few weeks! Yes, I could’ve easily spent two weeks there and done all the hikes. The scenery is spectacular! I wish it wasn’t so far away from Europe or the U.S.! Looks amazing! I am also horrible at solo travel. I’ve had my fair share of it, but for me I’ll always choose sharing the experience with another, preferably Dan! Also, I always get lost, so inevitably I would end up stranded if I tried hiking along. 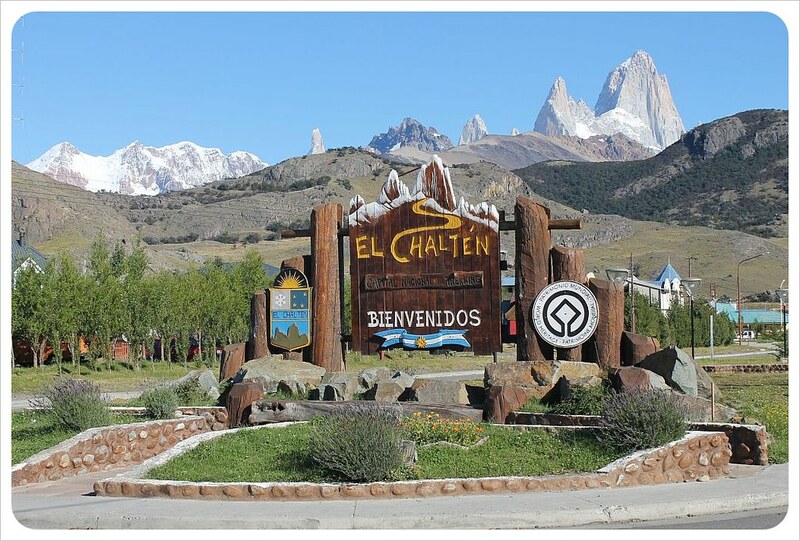 Good for you for totally dominating El Chalten, though. It looks truly beautiful. 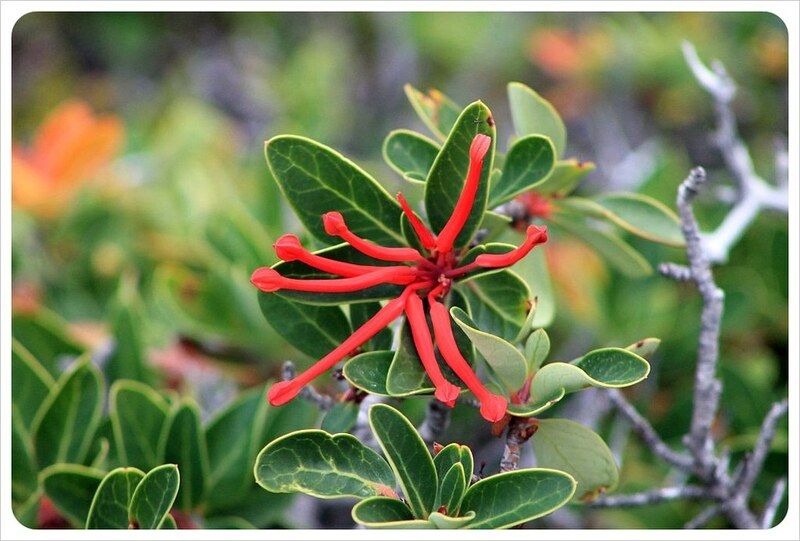 Great post, and amazing pictures – makes me want to go back to South America now! A few years ago, I was in north Peru (Huaraz region) with my then girlfriend. We were there for about two months in total and did several treks, including a five-day one, wild camping and carrying our own gear. And yes, it was amazing to do it together, talk like we’d never talked before and share the breathtaking views – and we’d never been as in love with each other as we were walking through the stunning flower-kissed valleys on our way back down. But then I have to say that the absolute happiest moments of my life have all been while trekking alone. Two years ago, I did the Everest Base Camp Trek – alone, without a guide or porter. I was gone for nearly three weeks as while up near Base Camp, I knocked on the door of a scientific research station to say hello and got invited to stay and volunteer for a couple of days – I ended up staying ten and was part of the team that set up the world’s first ever live webcam on Everest – this would not have happened if I were not alone! I actually got really sick with altitude sickness and walking back down was one of the hardest things I’ve ever done – it took four days and on the final day, I felt like I literally walked out from under the black cloud of grief that had been following me around since my father’s death, 18 months before. That trek changed my life and drastically altered my belief in myself. I now know I can achieve anything I put my mind to, and I also know that the experience would not have been profound in the same way if I were with someone else. So yes, I think there are pros and cons to both – but just to have the experience of being there, gazing out at some of the planet’s most awe-inspiring landscapes, looking down on the world and feeling like you can do anything – at the same time as being reminded of how small you are… that’s an incredible feeling and a true gift. And yes, I do look forward to sharing future treks with a loved one and soaking up those moments together – but I also know that any I do on my own will help me come closer to the meaning of it all. I do know what you mean about sharing an experience. Explaining to someone about how amazing something was is not the same as remembering a shared experience. On the other hand there is something very liberating about solo travel. I love both. I almost feel like you need to make a Trilogy. The first is in the bag with Dani going solo. The second is Jess going solo, then the Finale would be the two of you doing it. Awesome, Dani! We did both of these hikes too! I really liked how accessible the hikes in El Chalten were; that was basically why we picked going there over Torres del Paine. Thanks, Brian! Excellent overview, thanks for sharing!! You’re welcome, Jonathan :0 Aaaaaaaah yes the wi-fi was painfully slow while I was there… wondering if it’s gotten any better since my visit!